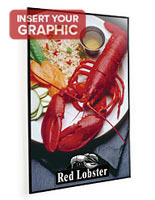 This Poster Frame With Black Matting Helps Your Promotional Art Stand Out From The Rest! Reusable Stick Tabs Make Mounting Images Simple. Thousands of Poster Frames Can Be Purchased From Our E-Catalogue! on most orders placed before 3PM EST! 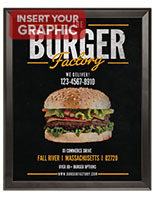 If changing and updating your 24"w x 36"h print ads and postings regularly is your goal, then this poster frame for wall displays fits the bill! An 1/2" w aluminum framework finished in satin silver can be opened via concealed metal hinges, providing you with quick and easy access to the display interior. 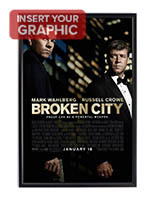 Updating this poster frame can be accomplished in under a minute thanks to the provided adhesive tape tabs which can be recycled and reused as often as needed. A Duraplast backer supports any installed prints or cards that are up to 3/16" thick. 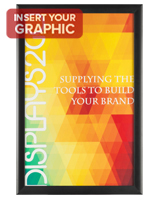 The poster frame comes with 1" black matting to provide contrast between the framework and displayed signage. 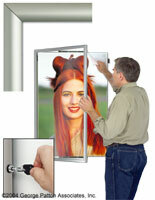 Your installed signs are further protected by a built in clear acrylic overlay. The gravity latch system hidden beneath the framework keeps the swinging door securely shut. 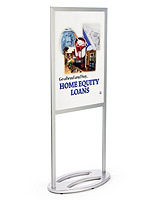 The practical poster frame that is silver has an overall measurement of 26.5"w x 38.5"h, while the viewing area measures 23.375"w x 35.375"h. The slender profile of this display makes sure that the entire structure extends a mere 1.5" off of the wall, while retaining the ability to swing open smoothly. 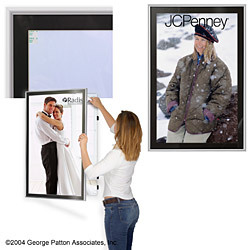 To properly operate the poster frame a 1.75" space should be available to the left of the display when being mounted. 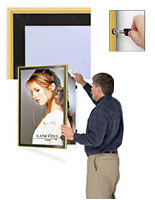 Hanging hardware and detailed directions are included with every poster frame purchase.